In 2012 the landmarked McGovern Weir Greenhouse, at Fifth and 25th, was purchased by Greenwood Cemetery, for use as a Visitors' Center. The greenhouse was in a serious state of disrepair, and needed extensive renovations, but after the purchase the greenhouse was forced to brave the elements for a couple more years without any protection whatsoever. Its decline continued. 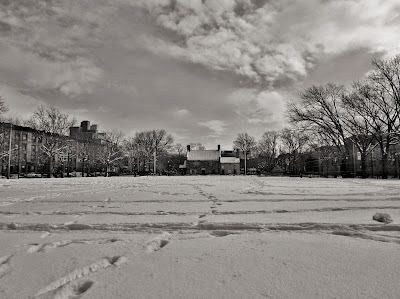 In early 2014, however, an article in the Brooklyn Spectator outlined the cemetery's restoration plans. At that time the projected completion date for the project was mid-2015. Plans included the demolition of two wooden buildings adjacent to the greenhouse, which were said to compromise its structural integrity. 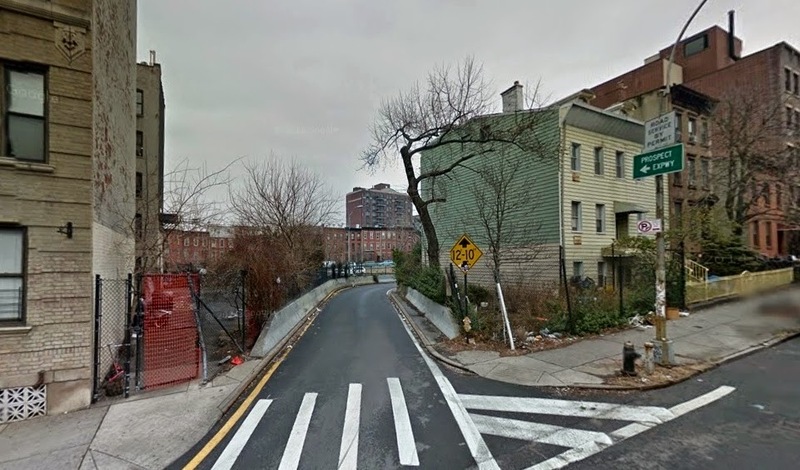 While HDC and CB7 expressed delight at the restoration plans, they also expressed concern over demolishing buildings of around the same age as the greenhouse. We have concerns. . . about approving the demolition of neighboring structures before a plan for replacement is presented and approved, wrote HDC. After all, even no-style buildings in historic districts cannot be demolished without Commission-approved replacement buildings. Are the conditions of the additions so dire that stabilization is not an option?That way, the structures could potentially be reused in future plans, plans which are still being drafted, HDC continued. CB7's Land Use Committee and full board unanimously voted in favor of Green-Woods plans to stabilize and restore the property. However, according to committee chairperson John Fontillas, the panels support was given with the understanding that well see the design draft once it is ready, and that the primary focus of restoration should be on the greenhouse itself before the neighboring buildings. According to Colleen Roche, a spokesperson for Green-Wood, everyone can rest assured that the Green-Wood team is working closely with the Landmarks Preservation Commission to ensure that its strict requirements are met. Renovation work finally began towards the end of '14, along with a new projected completion date of 2016. It certainly looks like this will be a slow & complicated process. The buildings slated for demolition have remained standing, and I'd assumed they had been reprieved, but I noticed recently that a permit was submitted in December for the take-down of a "two story structure." Is this the corniced building seen below? Here's another shot, from 2011. If this is the structure in question, is it worth saving? I think its simple shape complements the ornate design of the greenhouse very nicely. They look good together. We'll keep an eye on that permit application. Excuse the wonky picture. Here are four more three-family buildings about to bite the dust in the Fourth Avenue vicinity. 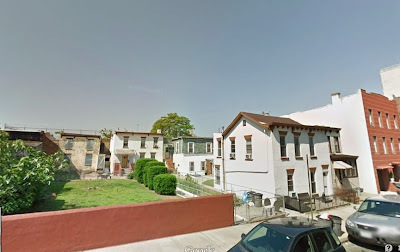 189-195 17th Street, just up from the avenue, have just been put up for sale as a development/conversion site. These brick buildings are still standing, as stated in the listing, but the site is also billed as vacant land. Clearly they're not destined to stick around much longer. 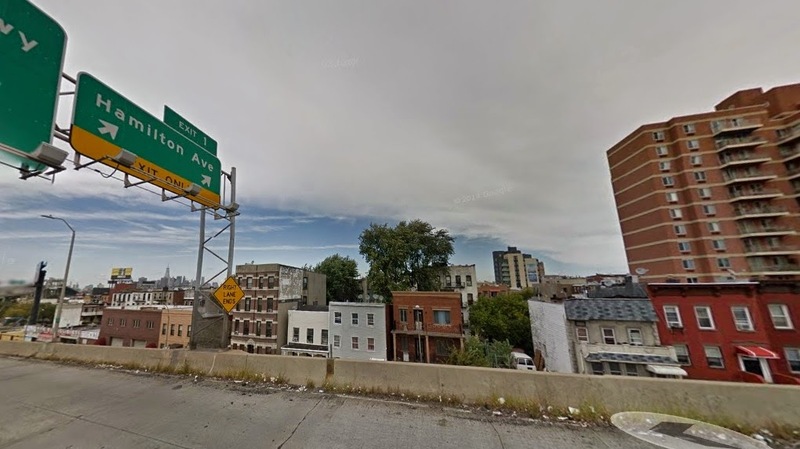 The area, according to the broker-speak, is an "emerging community," but it's hardly emerging for those displaced from small, walk-up apartment buildings. Receding fast, more like. If you look up at that wonky picture again, you will see a Google-warped lamppost with a sign fixed to it: NO HORN BLOWING EXCEPT FOR DANGER. Why might horn-blowing be something of an issue here? Well, this block of 17th, between Fourth and Fifth, is broken up by an entrance to the south-bound Prospect Expressway, and has a steady stream of traffic heading up the block. Thank you once again, Mr. Moses. This is another lovely street - a stately street of brick and brownstone atypical, in this vicinity - that was screwed over by the power broker. The expressway entrance is just a few doors up from our development site. Pity that poor house to the right, with its old lot razed almost entirely away. 189 - 195 are at the far left of the picture. Nos. 189 - 95, like all the properties on the north side of the block, directly abut expressway traffic. As you can see here. Right around the corner from Brooklyn's Park Avenue, these are today's million-dollar locations. And talking of corners, stores at the south-east corner of Fourth & 16th have been empty for some time, and the north-west corner business (briefly Country Boys) remains closed. I'm sure some of those visionary developers have plans for them. Here's another back-house. This one's on 8th Street, between Fifth & Fourth, and there's a similar back-house two doors up. I imagine there was originally a third one in between the two. 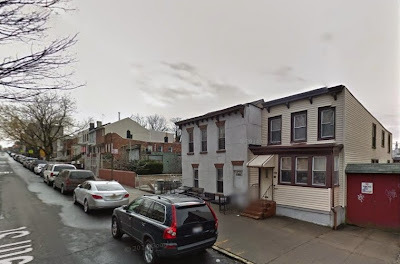 The front houses on this strip of the block are wooden and the rear houses appear to be brick. If I had the skill and the time, I'd like to use the Sanborn maps to catalog the back-houses that once existed between 8th, say, and 36th, and find out how many are still standing. Back in November the owners of 198-204 19th Street filed development plans for a 22-unit apartment building on the property. The 19th Street project is set to include 12 parking spaces (one more than required by zoning) in an open area at ground level, though the contextual zoning will require that the parking area be tucked behind the building. 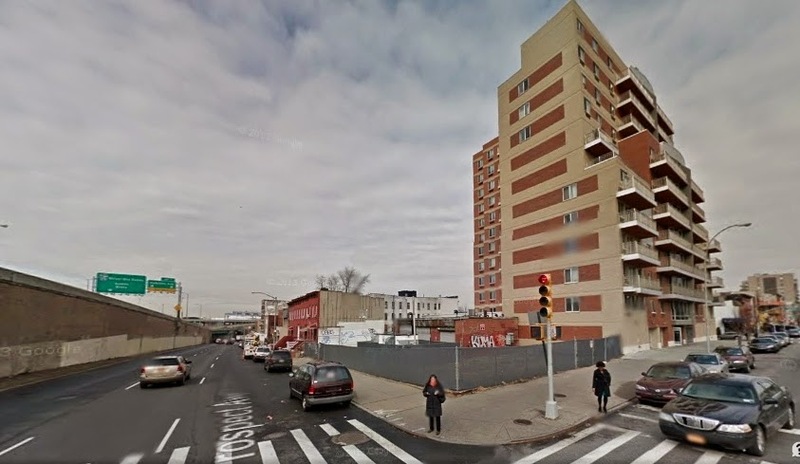 While the demolition of the three remaining buildings on the site was approved, plans for the new apartment building were not. As of last month the buildings to be demolished were boarded up and awaiting their fate. Today I noticed that plans were recently approved (2/18) for the demolition of two buildings (front & rear) at the adjacent 196 19th. The owner of 196 is listed as a David Pedram (Eshokol Development Corp.), and the owner of 198 is listed as Hadi Pedram (Atomic Contracting) . The owners share the same business address. 196 was transferred as a life estate deed in September '14, but David Pedram's name does not appear on the document. 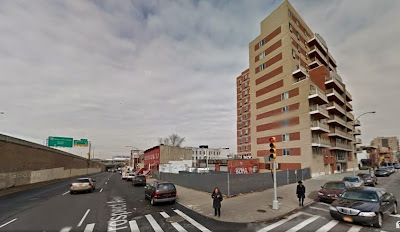 I expect that any resubmitted building plans will take the extra space at 196 into account. In truth I've become a little obsessed with this group of buildings, which in today's market fall into a category you could call expendable vernacular. 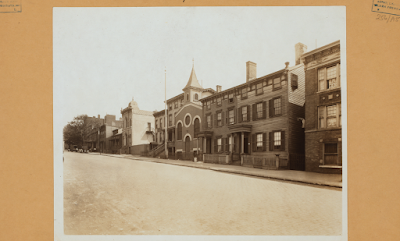 They might not mean much to preservationists, and are as far away from the world of landmarked brownstones a few blocks north-west as you can imagine, but to my mind they're just as important a piece of the neighborhood's history. 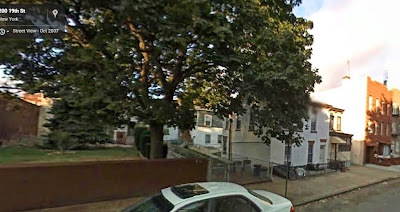 In the Google pics above, 196 is the partially-obscured house to the far right. Here's another 2014 shot from farther down the block. We've seen this one before. 337A (center, above) has been hanging around the market for almost a year, with a couple of other brokers handling the sale before Corcoran. Sold in April of 2013 for $570,000, it's been listed for as high as $1,795,000, but the sale price now is only $1,550,000. This is a lovely block, with Greenwood views up the street, and harbor views down. The broker-speak for this listing, however, has a few too many imaginative embellishments. Meticulous? The reno here looks like a low-budget job, with forlorn looking kitchenettes shoved in the corners of the living rooms. The house may be described as a two unit building, but it's not a legal two-family right now. It's true that an application for a change from one to two-family is in the works but it hasn't been approved yet. Was this house really built in 1930? An E.B. Hyde Brooklyn map dated 1903 clearly shows a building on the lot similar in size to this one (minus its recent add-on), though it is not evident on maps made a few years earlier. The Open House is today. See what you make of the place yourself. Inside the store there are bottles on a counter, bold-labeled Get It On, and painted on a rear wall the torrid line, Hold Me While I Let Go. 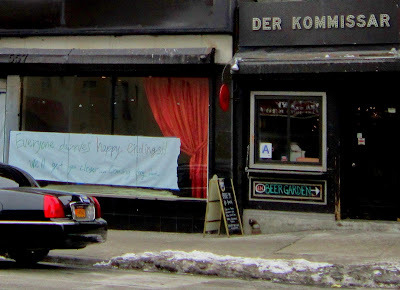 And next door, at Der Kommissar ... there are sausage samplers! Update, 2/24 And the name of the new store is Please. 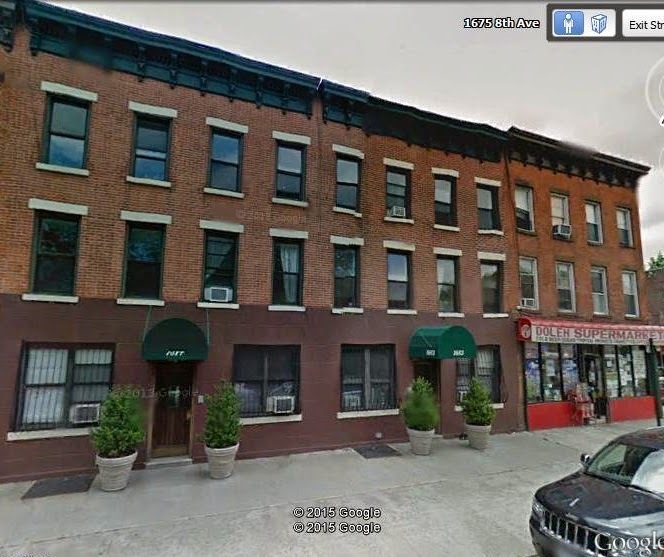 ... Douglas Eisenberg’s A&E Real Estate acquired a massive multifamily portfolio spanning 32 buildings across three boroughs from the Dermot Company for north of $360 million, The Real Deal has learned. The Brooklyn-centric portfolio contains more than 1,000 apartments — a mix of rent-stabilized and market-rate units — and 17 commercial units. 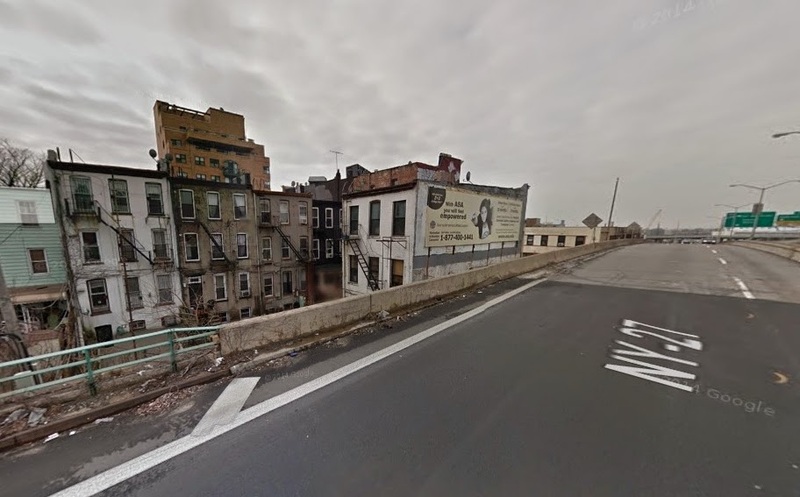 There are 19 buildings in Brooklyn, 10 in Manhattan and three in Queens. Of the Manhattan properties, eight are in Morningside Heights and two are in East Village. Six of the Brooklyn buildings are in the stroller-friendly Park Slope. 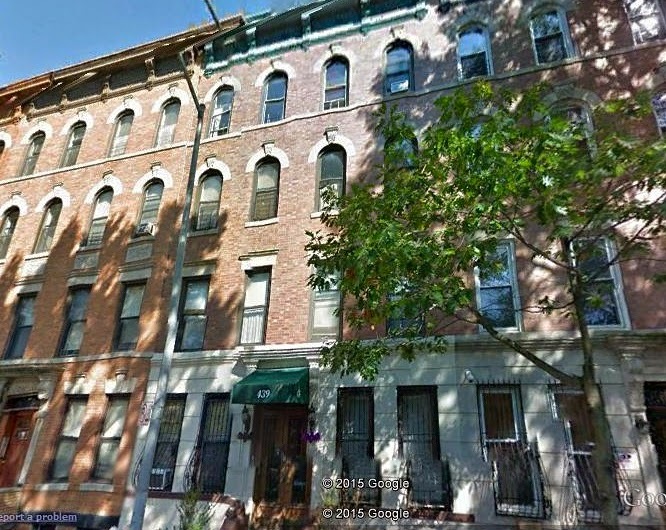 A six-story, 113-unit Clinton Hill building at 266 Washington Avenue is the largest building in the portfolio. 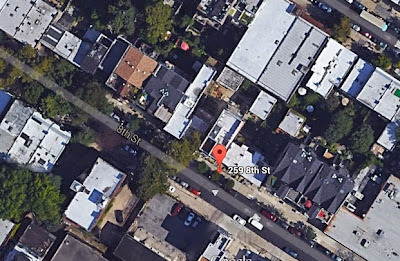 As I've demonstrated many times on this blog, I have next-to-no skills in unraveling the mysteries of property deals, but the rental site NY Bits identifies eight South Slope addresses as being owned by Dermot. All buildings were acquired in 2007. Foolhardy as it may be, let's assume that six of these buildings are part of the portfolio. We'll find out which ones were, & what prices they reached, soon enough (see above). There have certainly been plenty of complaints at the buildings above, including construction work without permits, cracks in an apartment ceiling, gas fumes & lack of heat, though few violations were ever issued. Few work permits are on file for these buildings since 2007, & many of the complaints recorded were (conveniently?) dismissed due to DoB inspectors' lack of access. State investigators are probing an uptown real estate mogul for hiking tenants’ rent — by double digits rates — sparking a fierce housing battle in Washington Heights. This summer, James Russell Outlaw, a disabled World War II veteran, received a letter from his landlord saying he would be evicted from his apartment after 32 years. Mr. Outlaw, who turns 83 next month, was losing his one-bedroom apartment, at Broadway and 135th Street, because the city had terminated his monthly housing subsidy after finding evidence of a vermin infestation, as well as a nonworking oven. On the coldest day of winter, Lady Liberty is sticking it out in front of the tax office. In crushed velour and foam crown, she is looking for customers. Her face is sunburn-red with cold. I ride home from Queens in a salt train. Oh & talking of food, I bear (possibly) exciting news concerning Jo, Brian & Joseph's Key Food, the long-shuttered market at Fifth & 12th. After I was told last month that the store was reopening, I've been noticing workers coming and going, rearranging shelving, and bringing boxes in and out. The action's looked a little desultory to be honest, though it's hard to see that much what with the papered windows and all. Anyway, today a worker told me that all problems (sign-off on repairs, landlord issues) are now resolved& that they will be opening SOON, perhaps even NEXT WEEK! It would be good to have a supermarket back here again, and even better if it were better stocked (fresh produce, please?) and better priced. We wait & hope. 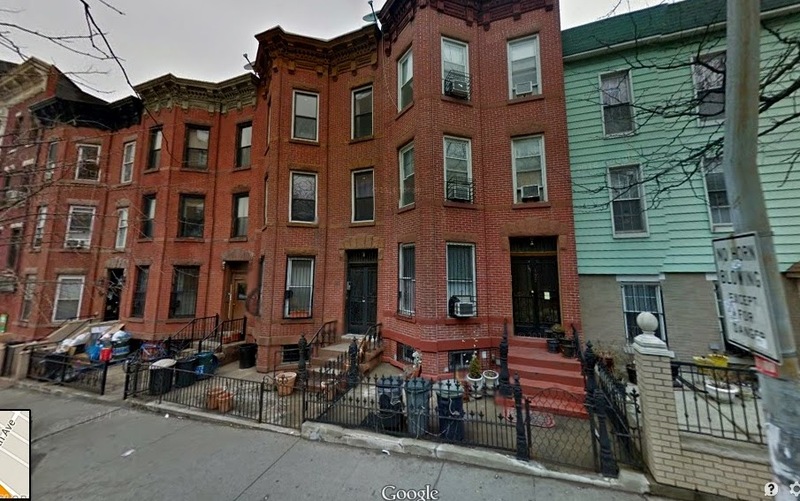 A three-story two-family house in red-hot Gowanus/South Slope has come to market just as this neighborhood's gentrification is in full swing. This contractor's special is the ideal canvas for the investor or end user looking to create income: Live in two stories while drawing income from the third, or combine all three floors to create a single-family home. Flexible floor plates allow for the renovation you choose, and the location just 50 yards to the R train at Prospect Ave, and to the entrance of the Prospect Expressway, make for excellent accessibility to Manhattan and Brooklyn. and here's a wider angle of the block, looking down from Fourth. 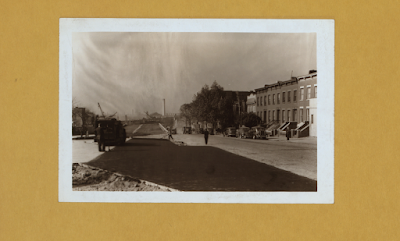 There are no interior pictures of 157 on the Corcoran site, & "contractor's special" suggests it needs work. There are no kitchens indicated in the floorplans. The house is twenty feet wide, and only twenty-two feet deep, and the backyard space looks small. If it weren't over a million dollars, and if it weren't facing the expressway, this could be a nice old home to settle into, but I'd say the ifs here are significant. 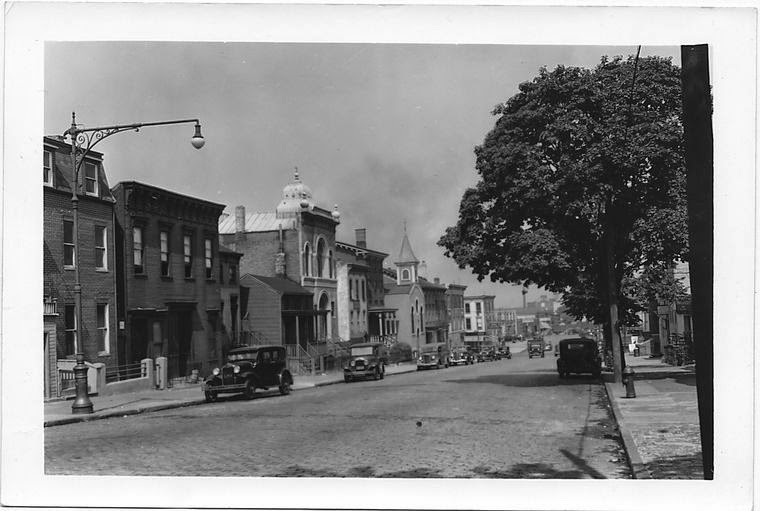 But ah, let's look at Prospect in the summer of 1940, before Mr. Moses got to work across the street. Wouldn't this southern side of the avenue be a fine view to face? Going back even earlier, a photograph from 1926 shows the same side of the block looking up from Third, and identifies nos. 136 and 132 as the Congregation B'Nai Jacob and the Hebrew School, but it's possible that the building was (at least originally) the Salem Swedish Lutheran Church, which moved to 46th Street at an unspecified date? 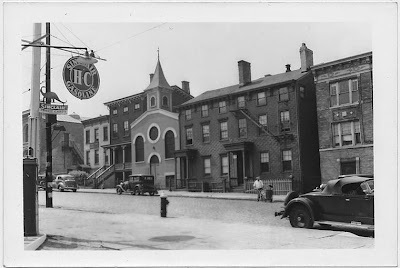 What a handsome-looking block this once was! By 1941, the southern side of the street was gone. Despite the less-than-charming situation, real estate action is lively around here. 189 - 195 Prospect Avenue (Fourth & Fifth) recently sold for 8 million, and the same buyer is apparently in contract for the purchase of the adjoining site at 575-581 Fourth at 7.5 million. 573 Fourth, sold in 2010 for $900,000 with a carriage house still standing on the lot, is now up for sale at 5 million, with the carriage house demolished and plans in place for a nine-storey-plus penthouse building on a skinny twenty-two foot lot. Also on Prospect between Fourth & Fifth, 270 Prospect recently sold for $2,075,000 (asking price $1,900,000) and next-door 207A sold last month. for $1,500,000 (asking price $1,700,000). Between Fourth & Third, up the block from 157, no. 169 sold in January for $998,000 (below the asking price of $1,299,000) and a sign outside no. 173, listed for sale at $950,000, declares the building to be in contract. Update: Hey, look! 157 in a Google driveby! It may be cold, but the light is sharp and clear, and by mid-afternoon the sun is kind to everything it touches. I'm back on 20th Street, below Fifth, one of those blocks around here that dips steeply down towards the water. Look, there's the Red Hook grain terminal, across the water where canal meets bay. It's not far at all. The houses on this block are mostly wooden. You can turn the corner and almost feel you're walking back into a photograph, a Loomis Sperr picture, say, of the thirties of forties, that itself reached back to touch a Whitman world. You're in a older borough. I love this group of houses on the north side, with their porches still intact. I love that they haven't become gussied-up-authentic again, with hardiplank siding, and new cornices. They might look pretty that way, but there's a danger of fresh, expensive tasteful looks, and fresh, moneyed inhabitants severing the connection the houses once had with the older world. There's no heart in a stage-set. I like them just the way they are.